﻿﻿﻿﻿Just a few days ago, my daughter introduced me to a delightful museum in Pasadena, the Pasadena Museum of California Art. This is a smaller museum than the Norton Simon but makes up for any size difference with excellent permanent and visiting collections. The Museum is in downtown Pasadena, near City Hall. Upstairs from Scharf’s painting are the main exhibit spaces. Until Sunday, October 14, 2012, nearly all the museum is given over to nearly 100 paintings and drawings by Edgar Payne, a Chicagoan who moved to California in the early 20th century and was swept away by the artistic possibilities. Payne was an American Impressionist; his paintings are best viewed from about six to 10 feet away, to best appreciate his use of color and light. Many of the pictures in this exhibit are on large canvasses and are breathtaking. 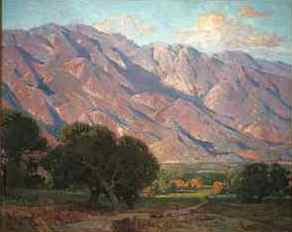 In addition to painting California landscapes, Payne’s painted scenes from New Mexico and Europe. An artist is not obliged to make his or her work realistic. However, two pictures in the exhibit of the San Gabriel Mountains are almost dead ringers for the mountains as they appear today. After visiting the eastern Sierras on a fishing trip with my friend, Dennis, I realized that Payne’s paintings of these mountains are as close to an exact copy to the landscape as one can come without a camera. The Museum does not have a permanent collection but has rotating exhibits. The next exhibits are described in the upcoming exhibits section of the Museum’s website and start Sunday October 28th. The new exhibits are devoted to Swedish-American architect and designer Greta Magnusson Grossman, sculptor and photographer Jessica Rath and printmaker Paul Landacre. Rath, who works in 'porcelain sculptures and large-scale photographic portraits of hybrid apple trees, is makng art with a bicoastal touch. The LA artist's exhibition is informed by visits to the USDA/Cornell University Plant Genetics Resource Unit in Geneva NY, which preserves endangered varieties of apples from extinction, and its Agricultural Experiment Station, in which apple clones are crossbred to create new varieties for large-scale consumption. About two weeks ago, I wrote about new postcard stamps issued by the United States Postal Service. The stamps include five vivid color photographs of classic and new Aloha, or Hawaiian, shirts. Then, a week ago, my daughter and I had a 20 minute excursion along the star-studded sidewalks of Hollywood. We lunched at Musso and Frank’s, the oldest restaurant in Hollywood and a favorite of writers, actors and general people about town. We saw the star for Harrison Ford on the sidewalk, a few steps from the restaurant entrance. We went into a souvenir shop and bought postcards. After this stroll, we went drove through the Hollywood hills. We were looking for the homes of two noir Los Angeles guys, Jack Nicholson and Harry Bosch, the main character in Michael Connolly’s LA police procedural series. Later, we learned that Nicholson’s house is no more, having burned in 2011. We thought we found a house that might have been the inspiration for the tree house-like cottage that Harry inhabits on Woodrow Wilson Boulevard, but are not sure. Well, thanks for reading this digression because we are going back to the stamps. . .
On the last day of my visit, I wrote postcards and sent them home. When I went into the post office, I asked for Aloha stamps. The postal clerk said they were all sold out. Instead, he gave me 32 cents worth of stamps for each card, which winds up as a 20, 10 and 2 cent stamp. If you want to grace your vacation postcards with these attractive stamps, it might be a good idea to buy them before you get on the plane, train or automobile. And, if you are in a CVS in California, there’s a very good chance you can pick up an Aloha shirt for a reasonable price, as the well-dressed model below is showing! 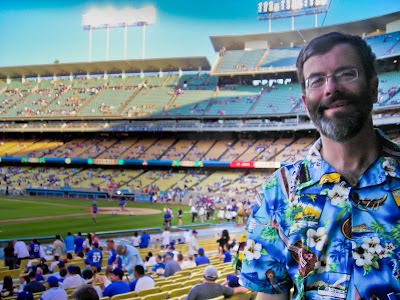 This shirt fits right in with the theme of Dodger Blue at a recent game between the Dodgers and Cardinals. Sending Post Cards in Style! ﻿﻿ ﻿﻿Thanks to the United States Postal Service, sending postcards home has just gotten a little bit more festive! The Postal Service has a new book of 10 postcard stamps. The stamps, which are also available for individual purchase, feature photographs by Rick Noyle of five classic Aloha shirts. As you can see from the photograph above, the shirts have appealing colors and delightful renderings of surfers, surfboards, fish and birds of paradise. Aloha shirts, also called “Hawaiian shirts,” are a fixture of my wardrobe - - and in wardrobes of other friends and readers of this blog. I first started wearing such shirts after seeing a picture of journalist Hunter Thompson in an Aloha shirt and white pants. I bought my first Hawaiian shirt at a sidewalk sale on the courthouse square in either Bloomington or Bedford, Indiana. A few months later, my friends Susan Jensen and Ruth Purcell gave me an Aloha shirt that actually came from Hawaii. Thanks to decades of pizza and beer, my first shirt fits snugly. My rotation now includes a Susan's and Ruth's shirt and a new shirt. While I have never been to Hawaii, the shirts on these stamps remind me of the times that we would sing along with Don Ho’s Tiny Bubbles in college watering holes and the nights as a teen staying up to watch the original version of Hawaii Five-O. With the approach of winter, using these stamps will help battle the sadness of shorter days. With the Internet, it’s tempting to take photos and send them home by computer. However, there is still nothing like getting a postcard with real handwriting and the actual feel of the place depicted in the card. Buying and sending lots of postcards helps our wonderful Postal Service, which is getting pummeled by the rise of the Internet. When you buy postcards on vacation, it is an artistic way to leave some of your money at a destination that you like! If any of you have pictures of yourselves in Hawaiian shirts, feel free to send them along. Perhaps with my limited computer skills, I can upload them and add them to this post! The view from the front yard. Mount Marcy is behind the trees. We rang out the official last weekend of summer on the West Coast, the West Coast of Saranac Lake in New York’s Adirondacks. 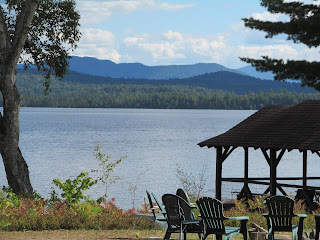 Our friends Jack and Mary Brennan invited us to their camp on Saranac Lake. Their “camp” is an attractive, rambling home from the late 19th century, separated from the Lake by a wide lawn. With its brown paint, large kitchen, screened-in porch and white pines framing the lake view, it is the quintessential Adirondack camp. For many years, I have wanted to see Mount Marcy, the State’s highest peak, but have not had the ambition or preparation to hike into the High Peaks Wilderness to see it. Within 30 minutes of arriving, Jack pointed out the summit of Marcy to me in the skyline of mountains visible across the lake. The next two days went along at a pleasant pace. In addition to Jack and Mary, there was a small crowd of congenial, conversational and welcoming guests. When it got too hot, people swam. For games there were board games and croquet on the lawn. There was a great dinner with grilled chicken and roasted vegetables, served on the big porch - - and an equally great breakfast the next day. Most of the land across the Lake from the camp is wilderness. So, I was intrigued when, during dessert, I saw a thumbnail sliver of light on a mountain summit. In what seemed liked seconds, the sliver became a nearly full moon. In equally quick time, the moon rose up through the pine trees and moonlight began sparkling on the calm lake. Later on, we had an unobstructed view of the Moon while sitting by a campfire. The fire-keepers honored the traditions of capable Adirondack guides by starting the fire with just three matches. The silences in the campfire conversations were occasionally punctuated by the cries of loons on the lake. This camp looks like a near replica of the big house in the recent movie Moonrise Kingdom. And, in fact, one of the guests had the movie soundtrack and played it in the bright morning. But the movie analogy works only to a point. Many of the characters in Moonrise Kingdom were dissatisfied or treated each other poorly. We were just a band of good-natured people, enjoying the moment. The pleasant memories will help us soldier on, when we are in the gloomy, rainy, snowy and cold days ahead.